Zellar's Village Inn offers a wide variety of services for your group, conference, special event or bus tour. We have everything here to accommodate all your needs. We will go the extra mile in making sure that your experience goes smoothly. Not only can we help with your next event or tour, we can also provide a variety of Newberry, MI lodging to assist in making your plans easier. Let Zellar's Village Inn of Newberry, Michigan help make your next event extraordinary! Zellar's Upper Michigan catering services can help you make your next event extra special. We provide our catering services for onsite and offsite events. Whether you are planning a graduation party or wedding, Zellar's can help. We can provide you with a catering menu or we can customize a menu to fit your needs. We are flexible and can cater your event here at our facility or at the site of your choosing. Zellar's can help make your special event memorable & affordable. Our Upper Michigan banquet & conference rooms are perfect for a number of different occasions. Both of our rooms have many special features that can help your event experience: plenty of room, food warmers (banquet room only), catering, coffee & alchohol - all available upon request. 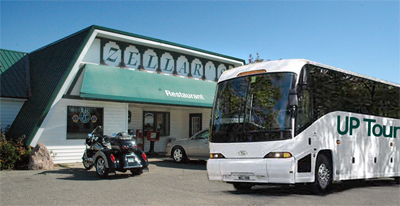 Zeller's welcomes Upper Michigan tour buses during any season. We can accommodate large groups touring throughout Michigan's Upper Peninsula. Please use the Request Info page to let us know: your date of arrival and how we can help make your visit the very best. Come and take a great relaxing break with us. 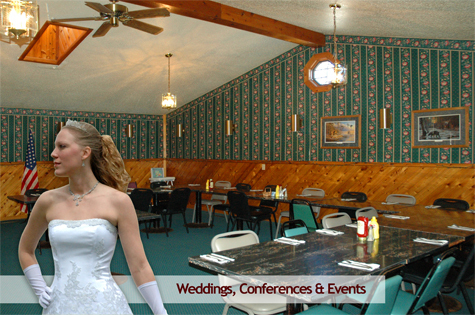 Let Zellar's Village Inn of Newberry, Michigan help make your next event extraordinary. Call, email or utilize the Request Info page to let us know how we can assist. Zellar's Village Inn everything you need, "All Under One Roof"